This entry was posted in Dogs and tagged dogs, Haiku, sleeping. Bookmark the permalink. What a cute photo. I’ll bet my mockingbird could wake Dallas. It’s obviously spring. That bird has been starting about 4 a.m. every morning, and is loud enough to be heard inside the house with the windows closed. So, I did the reasonable thing and opened the windows, so I could enjoy the concert. I hope he finds a girlfriend soon. Do dogs dream? Perhaps nice dreams explain their reluctance to wake up. How lovely, being awakened by a mockingbird concert! I’d have opened the windows, too. If your bird finds a mate, you’ll have a whole nest-full of little singers! Dogs do dream, Linda. 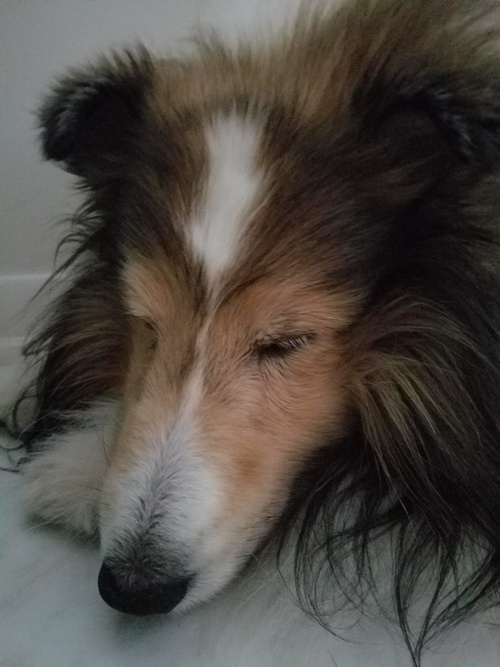 In fact, Dallas sometimes gets into such a deep dream state that his paws are twitching, his eyelids blinking, and his breathing sounds like he’s running a marathon! Debbie, I didn’t think Dallas could get any cuter! What an adorable capture! I love his blonde eyelashes. And I also love that quote. Stellar! Aw, thank you, Ron. Dallas does do cute things. Sometimes it’s hard to get him to hold still enough to pose for a photo, but that becomes easy when he’s deep in Dreamland! Thank you, John — I knew you’d understand, with two fur-babies of your own! Yes. Somehow they all seem to be the same. Makes it convenient when we get a second one! Awwww, Katie sleeps soundly too. She’s outside sleeping in the sun at the moment. I just saw a titmouse dart down and try to get some fur. THAT woke her up! Oh golly, Dallas would have been horrified! He likes to sleep outdoors on sunny days, preferably on the cool concrete or grass. I wonder how they sleep at night when they sleep so much during the day?? Aww, what a lovely picture! Animals are so much smarter than humans, just sleeping whenever they feel sleepy! My two sleep for a minimum of 23 hours a days these days, I swear! Twenty-three hours combined … or each?!? Dallas sleeps a lot more than he did as a puppy. I guess it’s a good thing he doesn’t have to work, ha!